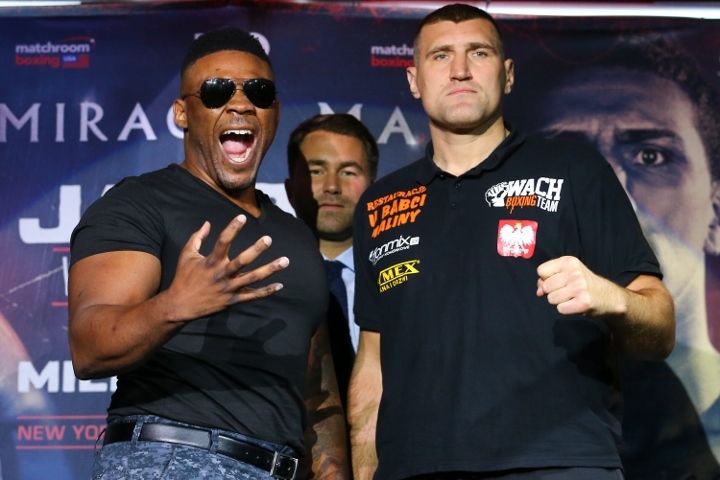 NEW YORK – Jarrell Miller messes with cheeseburgers and weights, not performance-enhancing drugs. The same cannot confidently be said for Mariusz Wach, Miller’s opponent November 11 in Uniondale, New York. The Polish heavyweight contender was suspended for a year after testing positive for an anabolic steroid following his unanimous-decision defeat to recently retired Wladimir Klitschko in November 2012. The 6-feet-7, 260-pound Wach’s history of PED use doesn’t concern Miller (19-0-1, 17 KOs). The loquacious contender from Brooklyn told BoxingScene.com at a press conference Tuesday that’ll he’ll knock out Wach (33-2, 17 KOs), no matter what, when they meet in the opener of HBO’s “World Championship Boxing” broadcast from Nassau Veterans Memorial Coliseum. Even in the wake of the Deontay Wilder-Luis Ortiz controversy, Miller doesn’t think Wach would use PEDs again before their scheduled 10-round fight. Miller admits, however, that he can’t relate to heavyweights who’ve risked their long-term health for short-term financial gains by using PEDs. “The whole thing is, man, you, as a human being, have got to see the longevity in your life and where you wanna be at,” Miller said. “PEDs are gonna cut your life short. I know I’m gonna live a very long time.